The Howgills Fell Race was the second race in this year’s English Fell Race Championship, which comprises six races, two short, two medium and two long. 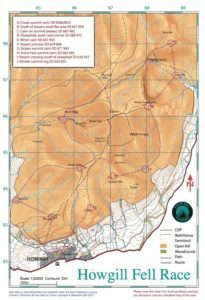 At 23km (14.3 miles) the Howgills might appear to be a rather short “long” race. But – and it’s a pretty big but – the 2,070m (6,791ft) of ascent (and, of course, descent) more than makes up for this – it’s the equivalent of one and a half ascents of Ben Nevis plus 50m. The route traces a figure of eight through these beautiful hills, which were bathed in spring sunshine. It comprises six climbs and corresponding descents with virtually no respite between them. The steepest section came just after midway, descending from 585m to 200m, only to immediately climb back to 660m, in about 2km.